And so begins the season of the deer hunting! It has been a bleak season thus far, for every hunter I know in Idaho... few have found anything... and yet we continue to look... My husband asked me to whip up a deer bag from sheets, because even our less-than-giant deer last year didn't even come close to fitting in the store-bought bags. 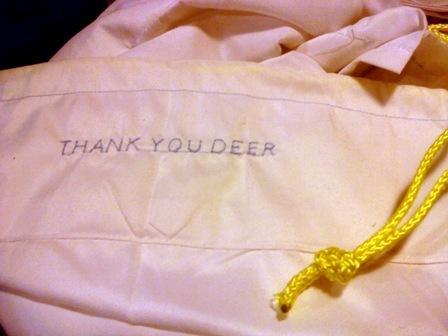 My decorative embroidery wasn't meant to be premature celebration, just a good luck offering, should a deer see the bag in camp and decide to jump in of his own volition. There has been much truck hunting and much hiking, and little has been shot... other than PICTURES of course! Hee hee!! And the views have been spectacular. I wouldn't have necessarily thought of Idaho as particularly rough terrain, but my heavens we have covered some ground this year! And the weather has been mostly gracious to us. If not a little warm for the deers... or so I hear. But not so warm that it wasn't time to bust out the Dutch oven and make chili! !